Clear your head. Distractions like TV, texting, video games and Internet surfing can seriously inhibit inspiration. Once your school term is over, schedule some time away from those electronic diversions and find a park bench, rooftop, library carrel, or some other quiet place where you can hear your thoughts bubbling up from deep down in your consciousness. Ask yourself exploratory questions. In looking for an essay topic, an excellent way to begin is by asking questions that can turn up some juicy conflict. Some examples: What has been the hardest thing I have ever had to face? If I had to quickly replay my life, which two or three moments would jump out ahead of all others? Which experiences have really pulled me out of my comfort zone? When have I ever felt pure rage? 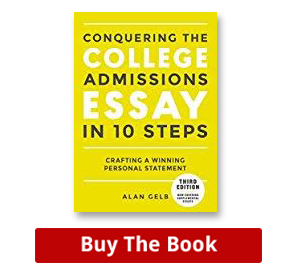 You’ll find questions like these, as well as a strategy for approaching them, in my book, Conquering the College Admissions Essay in 10 Steps. Write it down. Thoughts and ideas will be bubbling up for you this summer, as you look toward this time of your life that is so significant. Take it from this writer: if you don’t write it down, you’re bound to lose it. Enjoy yourself. 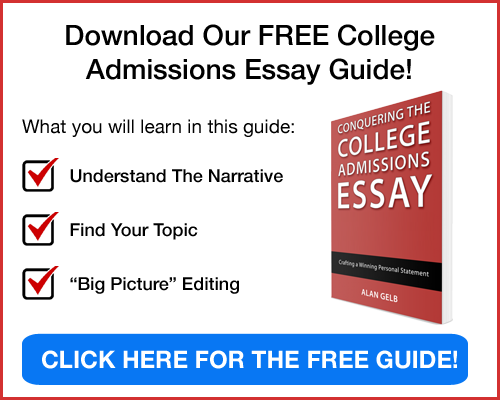 These warm, feel-good months make it easier to relax, and approaching the college admissions essay with less anxiety is a good thing. In fact, it would be extremely beneficial to view this assignment not as an onerous task but as a creative act. 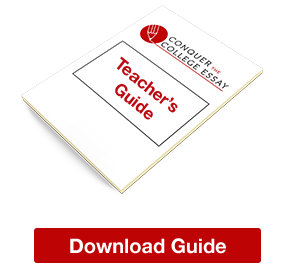 In that vein, you’ll want to commit yourself to the work, accept the idea that your essay will evolve through a series of drafts and allow yourself to take some pleasure in the process. Who knows? You may even discover the joy of rewriting. Go ahead. Take some time off, go bike riding, swimming, hiking, or what have you, but then take a deep breath and start the work that’s needed on the challenging task of writing your personal statement. “I know you’re terrified of this act,” said Ann, my director, “but you have to let yourself become vulnerable. We’re all here to support you. Trust us. We love you.” We were just days away from performing Our Town. I was Emily, I needed a breakthrough, and this was Act Three. At the end of this act, Emily, my character, dies but has the chance to relive a day with her family. She learns that the people around her did not really see what was important in life. Her idealized recollection of her life is shattered. She is deeply disappointed and saddened by her discovery. The only way to perform this last act is with great emotion. But, even though I knew this, I would not allow myself to go to a place where I could really feel Emily’s pain and loss. A few months before I left for this theater program, my sister, Beth, who was living in Chile, suffered a seizure. We learned that it was caused by a brain tumor that had been growing undetected for many years. Beth was flown home immediately for brain surgery. The first time I saw my sister in seven months, she was in the hospital on a stretcher with IVs in her arm. The night before her operation, the doctor told us what could happen during brain surgery. Beth could become paralyzed, lose memory, and she could die. I have never been so sad and terrified in my entire life, and I was so angry that this had happened. As it turned out, Beth came through the surgery well and the tumor was benign, but the horror of the experience has stayed with me. Day after day, we rehearsed the last act and day after day I stayed dry-eyed and emotionless. Howie held on to my shoulders and pulled me in all different directions. As this happened, I said my lines and suddenly started to cry my heart out. This was my breakthrough. My sister’s illness threw me off balance and changed my life forever. When, once again, I was thrown off balance, Act Three changed forever. In that moment, during rehearsal, my defenses fell and I was able to reconnect to the sadness I had felt. I discovered that I could go there again safely and grow from this experience. From that moment on, each rehearsal and each performance was done with great emotion. We were days away from performing Our Town. I was Emily, I had a breakthrough, and that was my Act Three.